Despite the fact that CZCS was an experimental mission intended to last only one year, the sensor continued to generate a valuable time-series of data over selected test sites until early 1986. 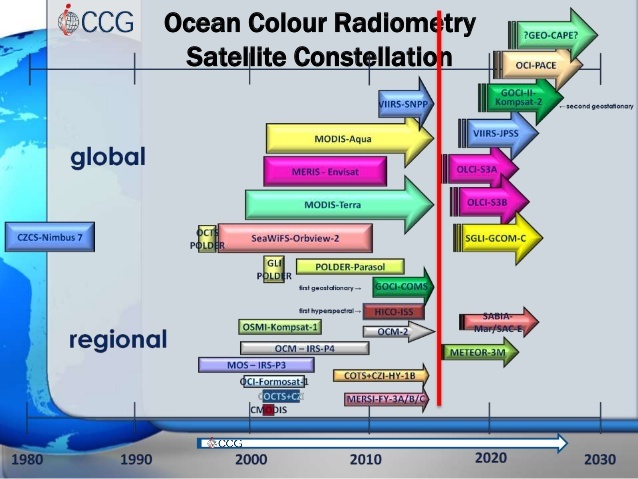 Ten years passed before other sources of ocean-colour data became available with the launch of MOS, OCTS and POLDER in 1996, and SeaWiFS in 1997. From then on MODIS-Aqua, MODIS-Terra and MERIS-ENVISAT, and more recently VIIRS-SNPP took over in the scope of ocean colour polar orbiting missions with medium spatial resolutions. More recently new missions such as SENTINEL-2 and SENTINEL-3 constellations offer great potentialities to monitor ocean colour and derived products such as chlorophyll-a. These missions offer improved spatial and spectral resolutions although the temporal resolution loss will be compensated as new satellites adhere to the constellations. You can consult the CEOS Missions, Instruments, and Measurements (MIM) database to see an updated list of all the Earth observation programmes and plans of the world’s civil space agencies.